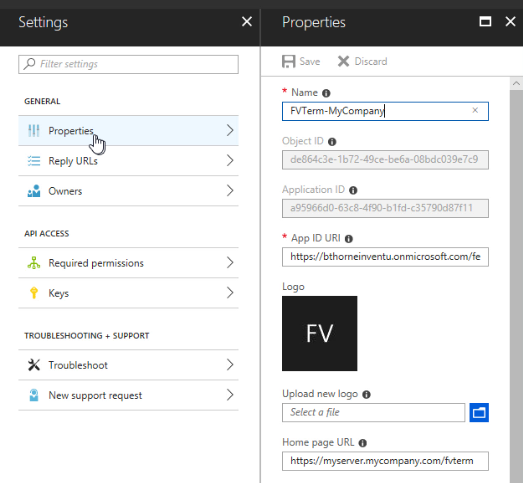 This page will guide you through the process of configuring a new Azure AD application that integrates with your Flynet Viewer FVTerm web application so that Azure AD becomes the security system for users accessing FVTerm. 1.You must have a Azure AD Signin that has administrative rights to your Azure AD configuration. 2.Your Flynet server must have a DNS name configured in your network--you can start with a server that is not fully accessible on the internet, but will eventually need a full DNS name for the Flynet server to configure in the Azure AD management pages. 3.Your IIS server must have an active SSL/TLS certificate. If you do not have a trusted certificate from an issuing authority, you can use the IIS server node's "Server Certificates" page and use the "Create Self-Signed Certificate" action. 4.Your IIS web site for FVTerm must have the https binding activated--this is in the site's "Bindings" configuration dialog--add https if it is missing. NOTE-PLEASE CONFIGURE HTTPS (step 4 above) BEFORE ATTEMPTING AZ-AD SIGNONS! Add a new Application-- use an appropriate name for the servers that will be supporting this application. 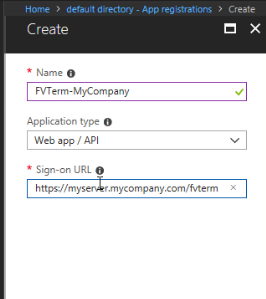 The application is now created in Azure AD--now you need to capture two key text strings that will be used when configuring FVTerm. 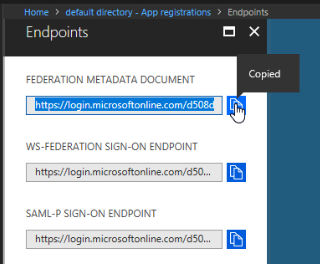 The next step is to obtain the finger prints (also called thumb prints) for the active Certificates used to encrypt and validate the sign-on with Azure AD. This requires you to view the endpoint document for the new application just created and copy the certificate to the clipboard. First step is to grab the URL to access the endpoints XML document...exit the new application details back to the list of your applications.